This will prevent Mirna from sending you messages, friend request or from viewing your profile. They will not be notified. Comments on discussion boards from them will be hidden by default. Sign in to Goodreads to learn more about Mirna. Yang paling intimidatif dari buku ini bukan ketebalannya, tetapi plot ceritanya yang sudah menyiratkan banyak sekali kekerasan ngeri di balik plot cerita petualangan. Sensasinya seperti nonton filmnya Quentin Tarantino, membuat Akhirnya selesai juga. 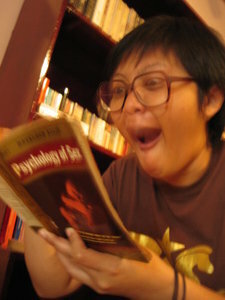 Yang paling intimidatif dari buku ini bukan ketebalannya, tetapi plot ceritanya yang sudah menyiratkan banyak sekali kekerasan ngeri di balik plot cerita petualangan. Sensasinya seperti nonton filmnya Quentin Tarantino, membuat gelisah dan agak mual. Sepertiga pertama buku terasa agak lambat karena begitu banyak misteri di Neverland, alias Avalon. Seiring pemahaman tokoh utama akan Avalon meningkat, semakin banyak peristiwa mengerikan, semakin cepatlah halaman dibalik seiring alur yang kecepatannya semakin meningkat. Bukan untuk pembaca pemula, atau yang penakut macam saya. This book was published after the Bartimaeus Trilogy and timeline-wise is a prequel to the trilogy. But it is also an excellent stand-alone book. So if you have yet read the Bartimaeus Trilogy, it is okay to read this. As with the trilogy, the book ha This book was published after the Bartimaeus Trilogy and timeline-wise is a prequel to the trilogy. But it is also an excellent stand-alone book. So if you have yet read the Bartimaeus Trilogy, it is okay to read this. As with the trilogy, the book has the plot narrated by different characters along the way, with clear separation, but also with obvious change of tone in narration. The book had been translated to Bahasa Indonesia, but I haven't read the translation, so I cannot testify if the subtle change in the tone is translated too. I finished this book in the same week I finished reading Monstrous Regiment, and cute enough, it has several similar theme. Concealment, disguises, and people finding their true self and true potentials after a long journey. Asmira, in disguise, discovered her true self after arduous fight, and actually had not much problems to move on. She found that she is indeed born and trained as a prolific guardian. Solomon, who let the ring defined his life for decades, finally comes to his senses and returned to his own self. And Bartimaeus... Because I have read the trilogy, Bartimaeus seemed a lot somber in this book. Much more sane, polite, wise even, compared to when he served Ptolemy and when he was enslaved by Nathaniel. During the ordeal with Nathaniel he was angrier. We’d love your help. Let us know what’s wrong with this preview of The Ring of Solomon by Jonathan Stroud. I borrowed the paperback from a friend and it took me several sitting throughout 3 weeks to finish it. Borogravia is in the midst of war, the country seems to always be at war due to being proud of their...pride. Into the last battle enters a group of I borrowed the paperback from a friend and it took me several sitting throughout 3 weeks to finish it. Borogravia is in the midst of war, the country seems to always be at war due to being proud of their...pride. Into the last battle enters a group of new recruits that earned the title Monstrous Regiment. It is lead by a seasoned and well-known veteran of many, many, many wars, Sargeant Jackrum, and comprised of a troll, an igor, a vampire, and girls. Oh, and a nerd. The theme is a frequent of Pratchett, on how strong, reliable and badasses women are while men are generally only good at being man. Except for Commander Vimes, of course. It also nudges on politics and policies and the tendency of men to burn themselves by being...man. Another theme that seems to caught my attention the most because it has been a resonance of repeats in my personal life in the last few years, especially the month I read the book, is identity. No matter how long you hide behind false pretenses, fake identities, some people will take notice. Some will also pretend along with you, because it fits their agenda. We’d love your help. Let us know what’s wrong with this preview of Monstrous Regiment by Stephen Briggs. “How often since then has she wondered what might have happened if she'd tried to remain with him; if she’d returned Richard's kiss on the corner of Bleeker and McDougal, gone off somewhere (where?) with him, never bought the packet of incense or the alpaca coat with rose-shaped buttons. Couldn’t they have discovered something larger and stranger than what they've got. It is impossible not to imagine that other future, that rejected future, as taking place in Italy or France, among big sunny rooms and gardens; as being full of infidelities and great battles; as a vast and enduring romance laid over friendship so searing and profound it would accompany them to the grave and possibly even beyond. She could, she thinks, have entered another world. She could have had a life as potent and dangerous as literature itself. Or then again maybe not, Clarissa tells herself. That's who I was. This is who I am--a decent woman with a good apartment, with a stable and affectionate marriage, giving a party. Venture too far for love, she tells herself, and you renounce citizenship in the country you've made for yourself. You end up just sailing from port to port. Still, there is this sense of missed opportunity. Maybe there is nothing, ever, that can equal the recollection of having been young together. Maybe it's as simple as that. Richard was the person Clarissa loved at her most optimistic moment. Richard had stood beside her at the pond's edge at dusk, wearing cut-off jeans and rubber sandals. Richard had called her Mrs. Dalloway, and they had kissed. His mouth had opened to hers; (exciting and utterly familiar, she'd never forget it) had worked its way shyly inside until she met its own. They'd kissed and walked around the pond together. Description: I write short, dashed, un-rhyming rhymes sometimes. Take a look at Mirna’s Year in Books. The good, the bad, the long, the short—it’s all here.